Since my last post in July where I finally got a vision down for the level design in Eye of the Temple, I've been feeling super productive adding new areas and features to the game. In August I added two new areas and in September I've been revamping the in-game UI and the speedrun mode. Only problem is I haven't kept up with these blog posts. To avoid this post getting too long, I'll cover the new areas here and save the UI work for a later post. Creaking Gorge is an area where you move along and into cliff sides and atop wooden scaffolding. 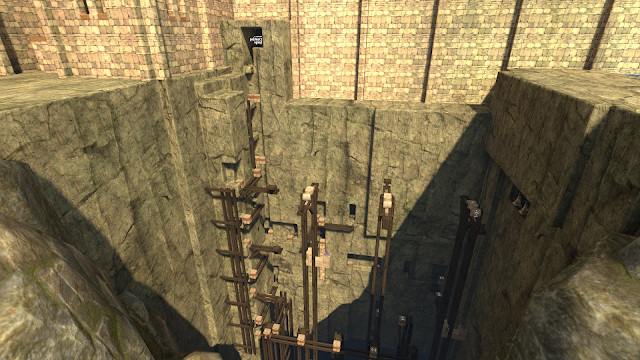 It's by far the most vertical area in the game, spanning more than 50 meters vertically. 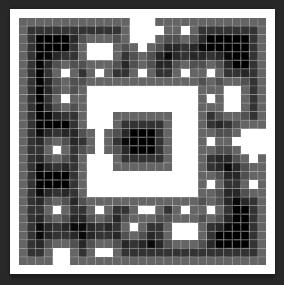 It's a fairly non-linear area too with multiple paths that can be followed in an order you choose. The verticality combined with the fact that not all of the paths can be seen, since they carve into the cliffs, means that it can be a challenge to keep track of your orientation and where to go next. It's an area of contracts since the bright and wide open space of the gorge itself is interspersed with ventures into cliff caves with narrow corridors and dark suppressing chambers. 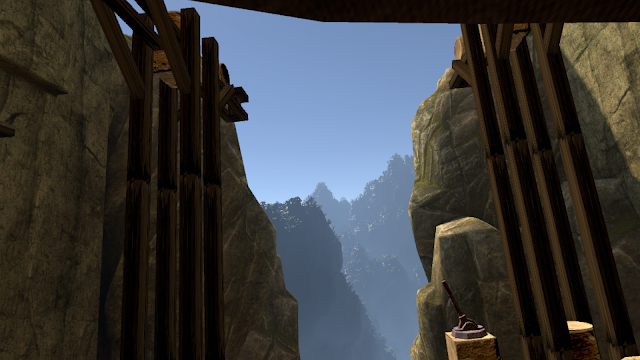 Creating Creaking Gorge was mostly a level design job, as the elements and mechanics of it were already present in the game, apart from the wooden scaffolding which is purely visual. Following Creaking Gorge comes The Cauldron, a smaller area taking place over flowing lava and involving fire traps and puzzles. The first thing I did for The Cauldron was start working on the lava surface. I looked at existing solutions like this Lava Flowing Shader, but its unidirectional flow is more suited to a lava river than the kind of lava pools I have. 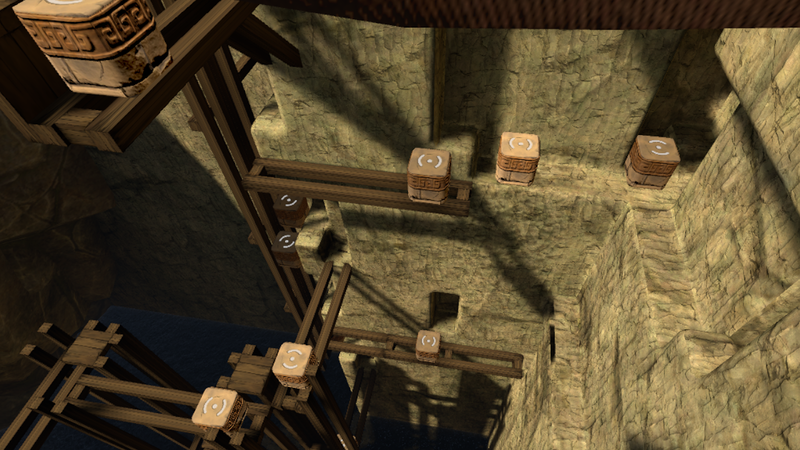 I ended up offsetting texture look-ups in two directions according to some sinus and co-sinus functions. Additionally there's a texture that maps distance to walls, so the flow can be slowed there and the lava also be darker. Here's that texture, and its effect on the lava. The bubbles are made with a particle system emitting sphere meshes, but they looked bad when I just gave them fixed or random colors. 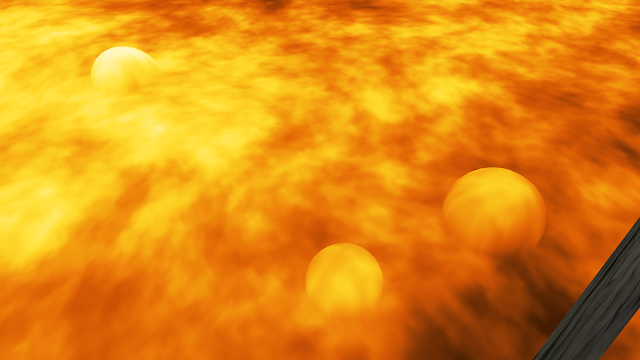 I ended up making the regular lava texture based fully on world space look-ups, not UVs, so the bubbles could be mapped identically. After adding steam particles, a better lava pattern, and baked lightmaps, the result looked like this: After getting the lava into shape (which frankly is purely visual too but adds a lot to the feeling of the area), I got cracking working out the puzzles. For the fire-based puzzles here, I had to generalize a bit how fire propagation worked so that anything that can catch fire can be lit up by any fire source. 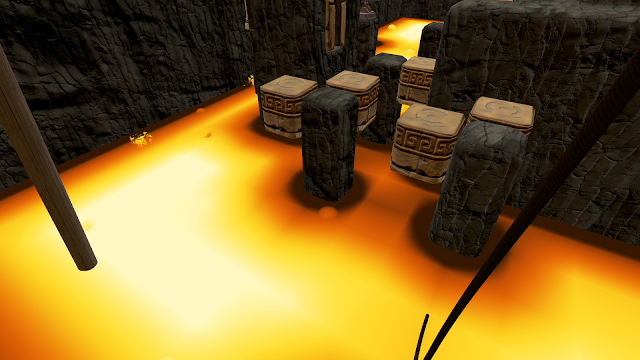 The result is some simple puzzles where the player has to use fire in new ways than previously. Two distinct new areas done in one month! I'll have a hard time beating that in the future I think, but here's to hoping.